On May 19-20, 2016, over 40 representatives from healthcare, education, business, government, film/TV, and communities of faith came together in a one-of-a-kind meeting at Harvard Medical School. 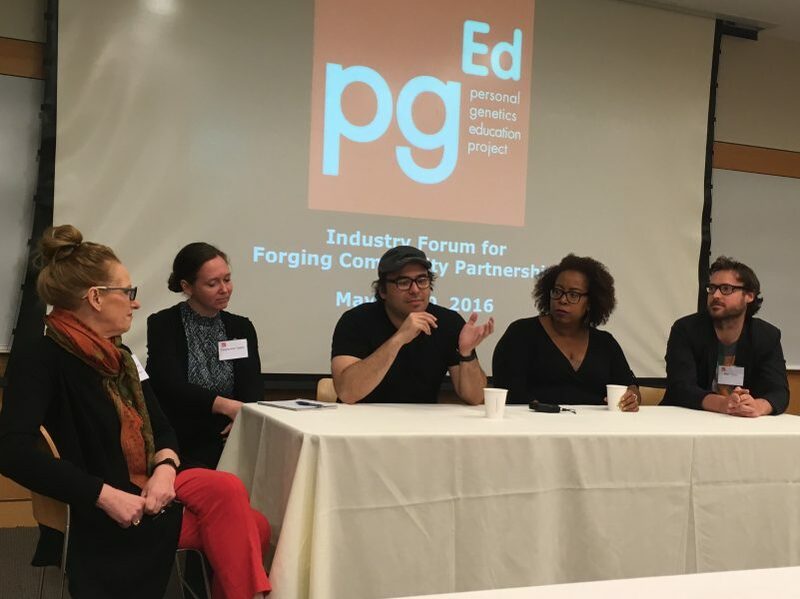 The goal of the pgEd Industry Forum for Forging Community Partnerships was to bring together experts from across disciplinary and community divides to explore strategies for tackling the gap in awareness and conversation about personal genetics between well-served and underserved communities. The leadership from some of the top companies in genetics, genomics, and gene editing, including 23andMe, Complete Genomics, DuPont, Editas Medicine, Illumina, Natera, Seven Bridges Genomics, and Veritas Genetics, were present to share their perspectives and explore the roles that companies may play. Click here for a full list of attendees at the Forum, and here for the agenda. A recurring theme at the meeting was “trust” – more precisely, the distrust that some in underserved communities have towards the biomedical establishment, reasons for this distrust, and possible ways to address this gap. 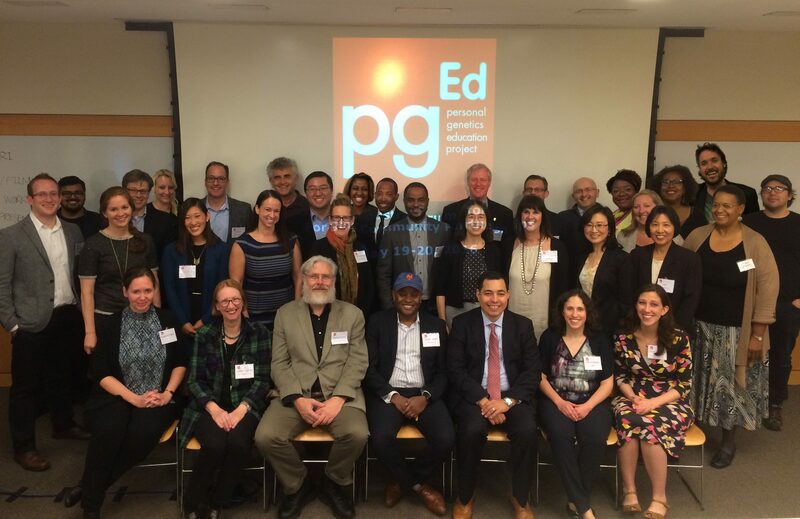 pgEd Director Ting Wu started off the first session, Awareness Gap in Personal Genetics between the Well-served and Underserved, by recalling the pointed questions and reactions during her visits to schools in underserved communities, highlighting the immensity of this distrust. James Corbett, Senior Vice President for Community Health and Values Integration at Centura Health, then spoke from the perspective of an executive in a major healthcare system. Prof. Maurice Godfrey of the University of Nebraska talked about his experience working with rural and Native American communities to improve science education in schools. And to place the Forum’s discussions in context, pgEd’s Director of Curriculum and Training, Lauren Tomaselli, presented on the eugenics movement in the United States and how this history of abuse and discrimination still contributes to distrust. 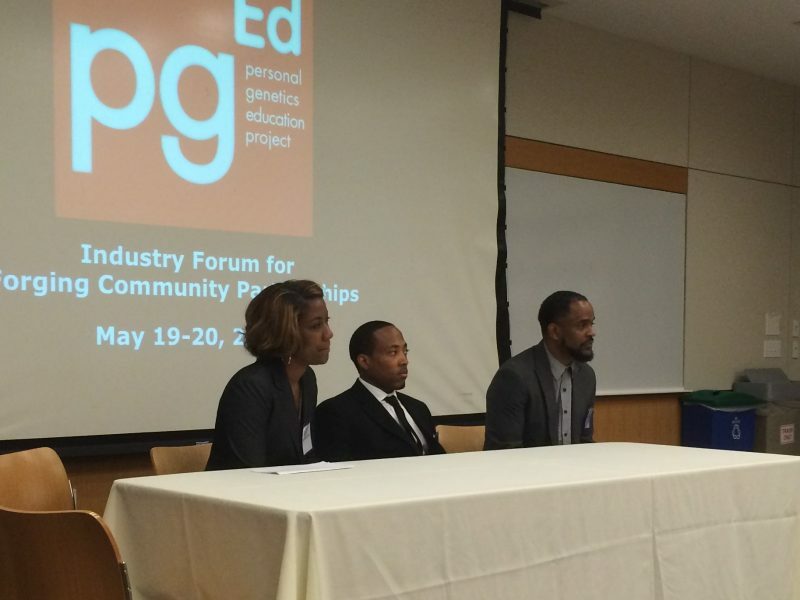 In Conversations about Genetics in Diverse Settings, speakers touched on strategies for engaging communities. Carla Easter, chief of the Education and Community Involvement Branch of the National Human Genomic Research Institute, described the “Genome: Unlocking Life’s Code” exhibit co-organized with the Smithsonian National Museum of Natural History. Richard Lumb, CEO of Front Line Genomics, talked about his organization’s Festival of Genomics, which is aimed at becoming a genetics conference for the general public. 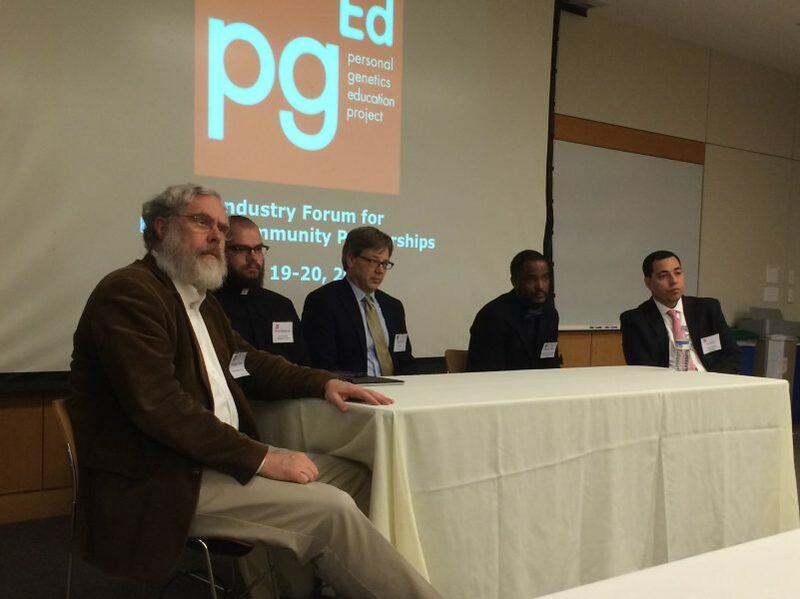 Aaron Stone, science teacher at Boston Day and Evening Academy, the student body of which draws predominantly from underserved backgrounds, used a lesson from pgEd’s curriculum to demonstrate how to rivet and challenge students in resource-limited schools. And Linda Grisham, Executive Director of the Center for Teaching, Learning & Technology Innovation at Massachusetts Bay Community College, discussed how community colleges are suitable sites for engaging underserved and minority communities. In Building New Partnerships – Working with Industry and Communities of Faith, speakers shared insights about bringing together different fields and stakeholders. Harvard’s Prof. George Church spoke about how genome sequencing can be democratized by lowering cost and open sharing of data. Doyle Karr, Director of Biotechnology Public Policy at DuPont, shared his company’s experience in consulting different publics on biotechnology development. Luis Belen, CEO of the National Health IT Collaborative for the Underserved, talked about the role of public-private-community partnerships that involve the government, industry, as well as underserved communities in developing technologies to eliminate health disparities. Michael Friend, founder of the Health Ministries Network, discussed their efforts to bring together faith leaders from minority communities and establish collaborations with academic researchers and biotech companies. Finally, Rev. Charles Baldanza of Christ the King Presbyterian Church – Jamaica Plain/Roxbury stressed the importance of two-way communication between faith leaders and scientists in order to address points of agreement and disagreement. Rounding out the presentations was Genetics on Screen – Harnessing the Power of TV and Film to Reach Broad Audiences. Session moderator Ann Merchant, Deputy Executive Director for Communications at the National Academies who runs the Science & Entertainment Exchange, opened by describing the power of stories to help people learn, and the important role that filmmakers, as storytellers, can play. Five award-winning writers/producers shared their work at this session, including Mike Cahill, who spoke about his films I Origins and Another Earth; Jacob Okada and Carylanna Taylor, who discussed their film in pre-production that explores what defines a human being; and Angela Tucker, who talked about her documentary web series Black Folk Don’t. Wendy Calhoun, writer and producer of the TV series Empire, Nashville and others, also joined in from Los Angeles via videoconference. The Forum was honored to welcome remarks from Jeri Lacks-Whye, granddaughter of Henrietta Lacks, whose story exemplified the sources of distrust between underserved and biomedical communities. Ms. Lacks-Whye recounted how the Lacks family is nonetheless proud of the positive impact that Henrietta’s cells (the HeLa cell line) have had in science and medicine, and reiterated the importance for the biomedical community to engage early and meaningfully with underserved communities. Finally, Forum attendees were challenged to devise strategies that could achieve nation-wide awareness and conversations about genetic technologies within five years. Attendees were divided into working groups to tackle four specific issues: how to build trust, especially with minority and underserved communities; how to reach communities without adequate internet access; how the scientific community and communities of faith may work together towards broadening the conversation around genetics; and how industry leaders can help accelerate public awareness and conversation without conflict of interest. The meeting drew to a close with each working group presenting its collective recommendations. All Forum attendees left with clear recognition of the urgent need to close the gap between well-served and underserved communities, and the immensity of the task ahead. Check out the news coverage of the forum by the Harvard Medical School office of communications, with interviews of Jeri Lacks-Whye and Ann Merchant.